It will happen. Your harp will break a string. It is possible for strings to break a day after they have been put on or for a string to survive for a decade or more. One fortunate thing is that harp strings rarely need to be changed. Harp strings are not like violin or guitar strings and they do not go "dead" in the same way. Monofilament nylon strings only need to be changed if they break, nylon/nylon wrapped strings need to be changed about every two years or so (if you play frequently) and wire wrapped strings once a year (again, if you play frequently.) Additionally, unlike a guitar or many other stringed instruments, we strongly recommend against ever changing all the strings on a lever harp at the same time. All harp strings are custom made for each individual harp. Changing the diameter (gauge) or type of string to something other than what the luthier designed for your harp will invalidate your warranty or, worse yet, seriously damage your harp. In order to select the proper replacement string you need the string number and you need to know which model of harp you have. To find the string number, count from the shortest string (#1) down to the broken string. If you already have a set of replacement strings pull out the proper number. If your replacement strings are notated by gauge use your string chart to make the proper selection. If you do not have the necessary string you may order a full string set or only the string you need by going to the Harp Strings page. Once you have the correct string then go to Step Three, if your string is a monofilament, or on to Step Four if your are replacing either a nylon/nylon wrapped string or a wire wrapped string. Take your monofilament string and thread it through the soundboard from the front (soundboard) side of the harp, run the string through the string hole of the soundboard, pushing it into the soundbox. From the back of the harp reach in through the access hole with your hand and pull the string out the access hole enough to tie a knot in it. If the string is short you may want to put a loop on the other end so that it doesn't slip through the hole while you are tying the knot. This method is easier than trying to tie the knot first and then pushing the string through the hole from the inside out, since sometimes you can’t see the string hole through the access hole. 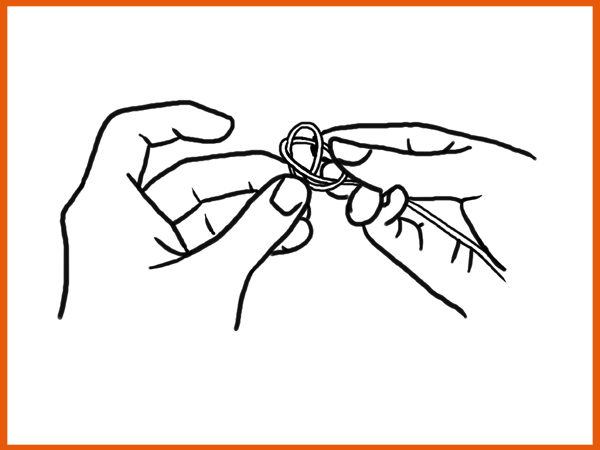 Tie the knot as shown in the Harp Knot Diagrams (Steps A through G below). 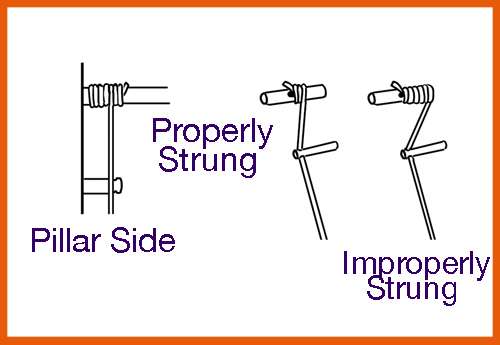 Be sure to use the extra piece of string or leather, as shown in Steps F and G, on strings .036 or smaller to prevent the knot from being pulled through the hole under string tension. After the knot has been tied, pull the string through and seat the knot firmly against the midrib. For additional assistance click on the Watch Video button below. Step A - Make the first loop keeping the loose tail of the string to the back. Step B - Make a second loop with both of the tails to the back. Step C - Pass the second loop over the first. Step D - Pull the second loop tight. Step F - For strings .036 gauge and below, insert the short, leather anchor piece into the first loop. Step G - Pull on the long part of the string to tighten both loops as far as they will go. String knots should fit snugly without the knot being pulled through the eyelet. If your string is a wrapped string, either nylon-nylon or wire wrapped, the knot is already tied for you and all you have to do is thread it through the string hole from the inside out. For a nylon/nylon wrapped string be careful not to force it or pull it too quickly. Be gentle. If the thin nylon wrapping breaks the string is ruined. After the string is through the hole from the back, pull on it slowly from the front to firmly "seat" the knot. Now that the knot is seated against the midrib, grab the other end of the string and pull it all the way up to the tuning pin. If the string is of large diameter, you should cut the string with a knife (like a box knife) or at an angle so that a clean (non-flattened) end will fit through the hole of the tuning pin. Never cut a wrapped string on the wrapping because it will unwind and the string will be ruined. The only part that can be trimmed is the plain core that sticks out at the end. If the wrapping extends into the area you need to cut, you have the wrong string. Wrapped strings are ordered by their vibrating length (the distance between the soundboard and the bridge pin). When the string is made, the maker will add additional core length to allow for the part that goes through the tuning pin and the additional wraps around. Three or four wraps which then drop straight to the bridge pin is correct. 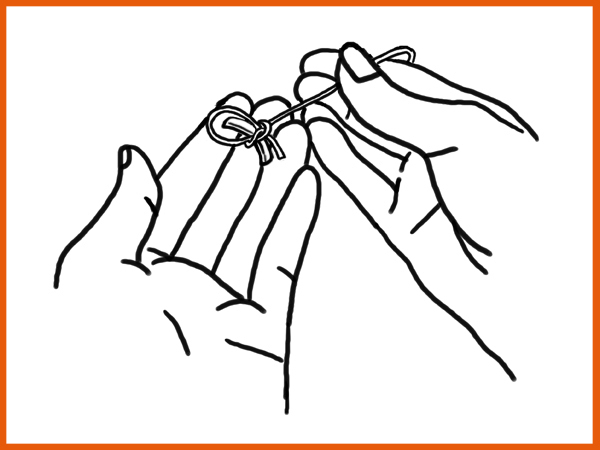 Before you thread the string through the pin it is very important that you turn the pin to which you will be attaching the new string counter clockwise about four turns. Zither pins have threads and if you do not back the pin out enough each time you replace a string, the pin may eventually screw too deeply into the neck. After the pin is backed out four full turns, you can proceed. Next, regardless of string type, place the end of the string through the hole of the tuning pin so that about 1/4 inch of the string sticks out on the other side of the hole. Turn the tuning pin and wrap the string in the same direction as the neighboring pins. Try to line up the windings so that the string drops as straight as possible in line with the bridge. Whew! All the hard work is done. Now bring the string up to pitch slowly. Turning too rapidly may break it. The new string will go out of tune quickly for awhile until it stretches and the knot tightens up. Be patient and remember that the more frequently you tune that string, the more quickly it will settle in and hold for you.